19’th century is considered as age of steam and electricity, 20’th as television and internet. In inQen we believe that 21’st will be the age of the intelligent devices, able to communicate with each other in non-invasive for the environment way. In front of the very dynamic development of the technology, there are various attitudes possible to adopt – observation of the trends and implementation of those already proved or co-creation of the way how the new technologies are implemented to our needs. InQen adopts proactive attitude. We believe that in front of the current speed of the development of the new technologies, their implementation on the latter stage leads to waste of time, efficiency and recourses, which finally has considerable impact on the financial results. InQen’s ambition is to deliver our clients a competitive advantage, thanks to deep knowledge of the newest technological trends and ability of their adaptation to the concrete needs. Our long-term engineering and business experience makes us unquestionable of the results. According to quantum physicists ‘measurement is everything and reality at the quantum level does not exist until you are looking at it’. In inQen we believe that this sentence is valid for our reality or at least to some of its aspects. Every day we are surrounded by information and data, which are coming to us from different sources. Those pieces of information, which we miss for any kind of reason, simply does not exist for us. Also more and more often we are absorbed by pieces of information totally useless and at the same time we miss facts which are important. 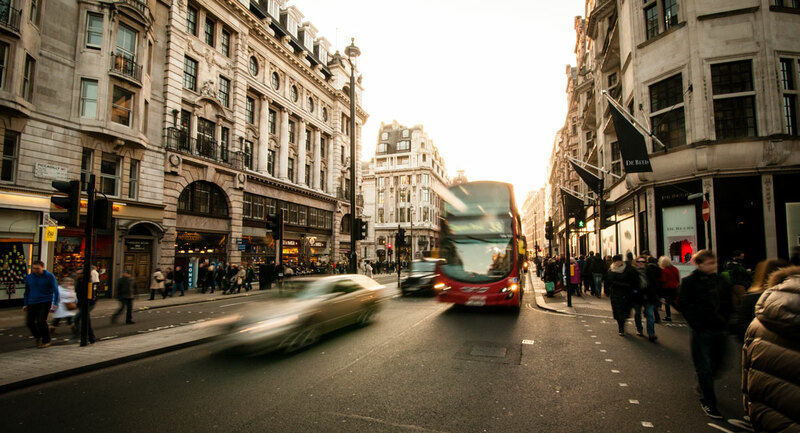 In inQen, based on the Internet of Things and the latest technologies we offer our clients access to the data and information, which play an important role for them. Thanks to this we avoid that something is happening without our control, which in light of the leading an effective business is the one of the fundamental things to prevent. By installation of various types of sensors (temperature, humidity, flow, liquid level, state of the work of particular device, etc.) and wireless transmission to the cloud, we offer access to the data, possibility of the analysis and further processing. Collection of the data in one place allows for analysis and drawing a conclusions. For example access to the data concerning power consumption and its distribution within the facility may lead to the reduction of the consumption, information about decrease of the device’s performance may prevent unplanned operation brakes. Similar examples may by multiplied. The other advantage, which we may deliver to the client is the possibility of remote monitoring and control of the devices. This leads to the cost savings related to the travel and physical presence on the remote destinations. Our system is very flexible, open and thanks to the wireless transmission practically non-invasive for application. This makes it applicable at wide range on various objects. Amount and type of the collected data are practically unlimited and only depends from client’s ideas and invention. If you are involved in a complex expansion project and under the gun to make it as seamless as possible, then consider using our 3D Laser Scanning Service. 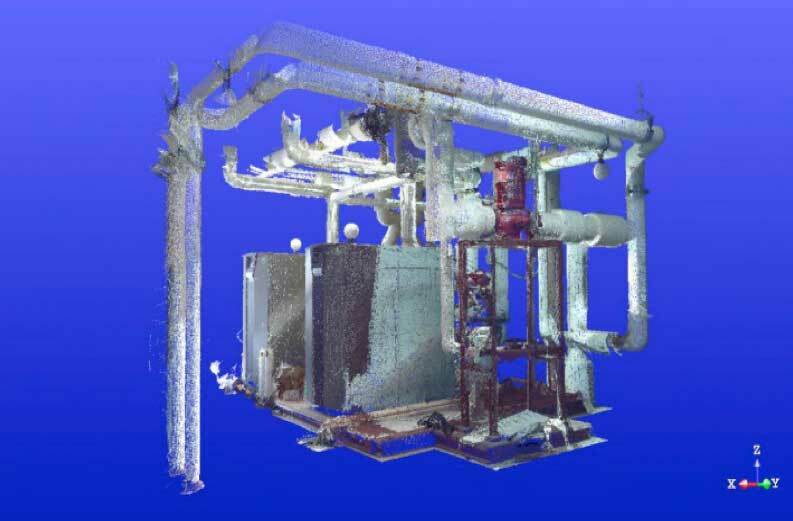 The service includes laser scanning your existing conditions as well as conducting a full registration of the point cloud, and then coordinating the new with the old for design validation. As a result a physical 3D scan of your project will be conducted. A fully registered “point cloud” of the existing environment that can be used as an export into your 3D Modeling solution as an as-built comparison to modeled components. Once scan data has been collected, in the form of Point Cloud, we can take the next steps in turning this as-built data into a working 3D model. 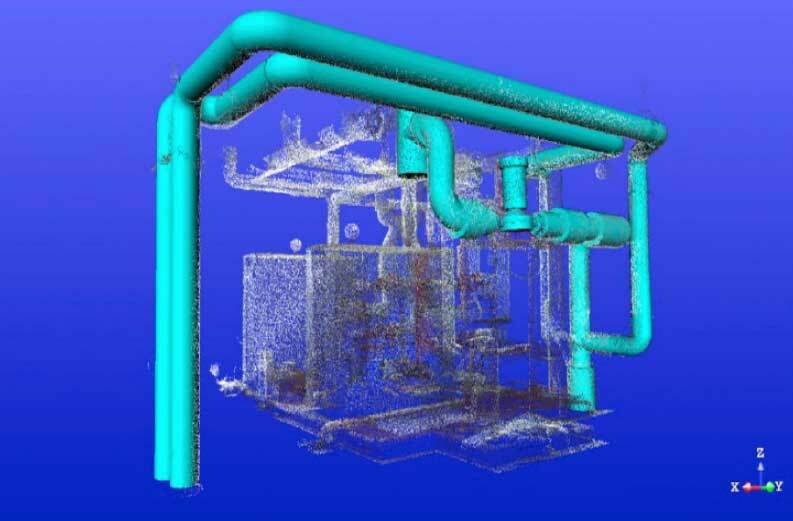 Using the point cloud to generate 3D solids, the service can then export these modeled components to your chosen 3D modeling environment for further detailing and refinement as specified by project requirements. Additionally 3D model can be used as a solid base for the future expansion works. By using this you will avoid collisions and surprises during the design and execution phase. 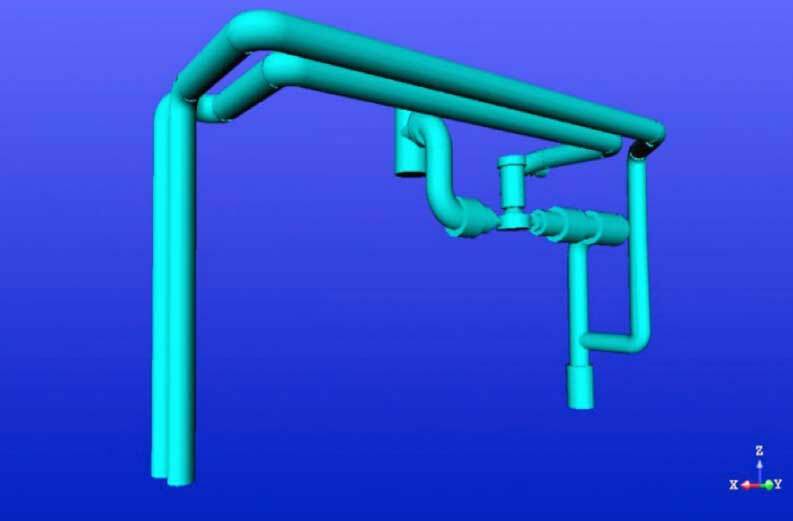 If our clients have 3D design and/or viewing capabilities in a CAD program, a 3D model is by far the most efficient and productive deliverable. Modeling is time consuming and thus can be expensive, but instead of a client receiving a 100 GB point cloud that is almost useless to them, the same site can be modeled and deliver in CAD format. The file size of a model is rarely over 10 MB’s. 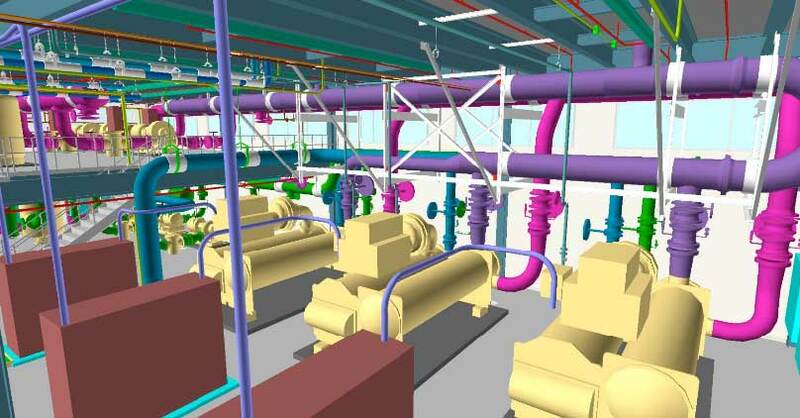 The model deliverable allows the engineer or architect to insert the entire model into their drawing and design directly on existing conditions in a 3D environment. Most of the data collected currently in the industry is analyzed mainly in light of detection and control but not in light of optimization and forecast, which is the biggest value. In order to meet the newest trends and expectations from industry we offer our clients connection of their equipment and production lines to the internet and remote control their work and status. Our offer concerns an innovative approach to the data collection and monitoring. All types of sensors: water level, temperature, pollution or others can be mounted at any place in your premises. Thanks to the connection to the internet all the data collected by the sensors are directly send to your website. There is also possible that we connect our devices to the already existing sensors in your factory, without any exchange of the standing infrastructure. Our devices work based on the technology of Internet of Things. Non invasive and quick installation, wireless connection between particular devices guarantees immediate effect. Together with installation of our sensors and devices we grant you access to the website, where all the collected data are presented in preferred by you order. Thanks to it, our clients have immediate and online monitoring of all the required records. Our sensors of water level, temperature or other are mounted without any significant interference on your installation or equipment. Our devices can work without external power supply (in that case batteries are used). Devices start to work and measure specified value with required frequency /day; /sec; /hour or any other. At the same time our clients get access to the dedicated website, where all the collected data are presented in graphical or any other required form. Online control of all the measured values – possibility to log in from any place and from any device equipped with web browser. Cancellation of manual and time consuming collection methods. hanks to the possibility of free crossing of different type of data we provide completely new possibilities of analysis and drawing up conclusions, like: preparation of energy savings programs, basis for the sustainability systems or lean management programs. We help in every place where archive and access to the historical data is important for our clients. Easy and fast collection of the data for energy audits, due diligence reports. Forecasts of the work and state of the equipment – prediction of the breakdowns. Maintenance planning and minimizing the risk of the unplanned production stoppage. Considerable reduction of the control switchboards and related costs.